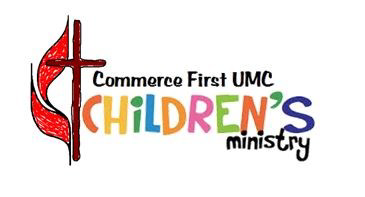 At Commerce First United Methodist Church, we are committed to teaching every child the love of Jesus through creative, hands-on programs offered in a safe and loving environment. Be comforted to know that we are a Safe Sanctuary church. This means we screen anyone working with children and train them in the policy and procedures on reducing the risk of child abuse. We pray you will find many opportunities for your child to grow in their spiritual journey here at Commerce First United Methodist Church. Beginning with the very youngest children, our nursery staff starts laying the foundations of faith through song, dance, laughter and love! We are dedicated to meeting the needs of each of our children and their parents. On Sunday mornings while parents are attending worship and Sunday School, we strive to provide consistent and loving care for children in a safe environment. Nursery care is available on Sunday morning for children, Birth through 3 years of age, from 8:45 a.m. to 12:15 p.m. The nursery is located on the 1st floor of the Education Building. Please know that your children are always welcome in worship. In the cry of a baby, or the fussiness of a toddler, we hear a new voice that speaks to God as we all do–in happiness, in sorrow, and in discomfort. Many of us have (or once had) small children, so we’ve been there. We welcome the reminder, in a child’s voice, of the blessing that children are to all of us. At 11:00 am, children accompany their families in worship. They are encouraged to sing and celebrate God's goodness and love. By attending service, the children learn the importance of worship and begin to build a foundation on how to act and participate in worship. Preschool through Kindergarten are dismissed after the children's moment for Children's Church. Every week love – age-appropriate learning about Jesus through play, lessons, crafts and music. Drop off and pick up is in the Sanctuary. Families are invited to stay for Family Night supper at 6:15 pm. See the church monthly newsletter for other activities and, for all church activities, please see the Church Calendar.